HotRadio is a complete radio automation software, which concerning all the other automation programs, has a big advantage. It has been developed by radio producers, people that live and dream through radio and know better than anyone else radios true needs. HotRadio reached its second version with a more mature, flexible and functionnal version, always based on its simplicity. Having the experience of the first version, the second one covers most of needs that a powerfull modern radio station has. If this is your first contact with HotRadio, we will make a small introduction. 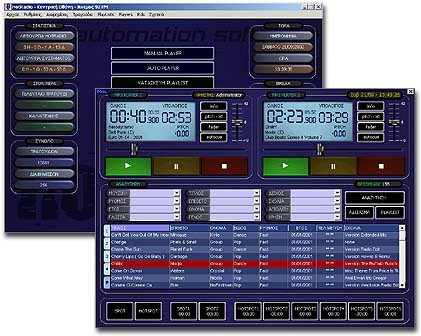 HotRadio is a complete radio automation software that can handle... almost everything. It provides the possibility to import songs from Audio Cd (audio extraction), from Line in or from mp3 format and categorize them based on roughly 10 categories (title, album, artist, type of music, rythm, grade, date, etc). Hotradio provides also the possibility to create lists, on manual or auto mode, based on the criteria that the user sets. As far as the advertisement issue, HotRadio accepts daily scheduled advertisements program, providing at the same time many facilities covering all the advertising needs of a modern radio station, in both client and radio station spots. In this new version, the program provides certain useful operations like the possibility of direct burning of audio cds, automatic creation of backup files and many other facilities that you can discover on your own by testing the demo version. Having an open field structure, HotRadio allows every radio station to customise the software automation specially on its needs. memory. HotRadio communicates directly with concrete types of RDS Encoders in which it sends information about the transmitted song, artist, hour, producer etc. It can work over the most popular OS like Windows 98, Windows ME, Windows 2000, Windows XP. Constructors proposal is Windows 2000, for which the second version has been set up. It collaborates with most of the sound cards of market, without particular preference. It provides the possibility of operation with one, two or even three cards, having… sympathy in multi output sound cards, equipment that simplify mainly the card installation procedure.